Do you love playing casino slots online? 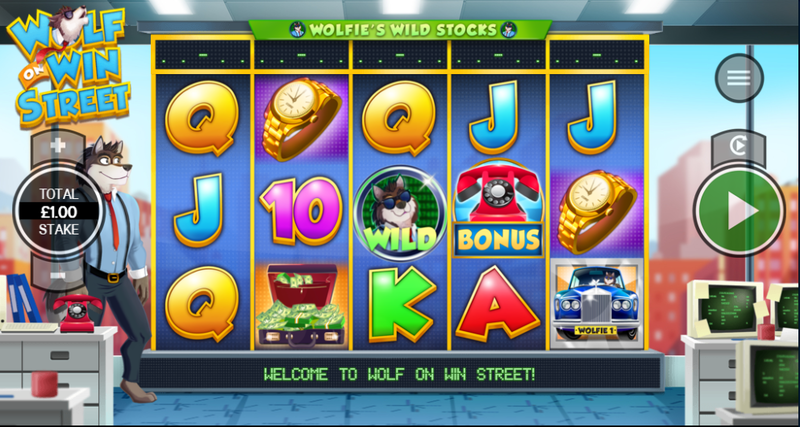 Well you won’t be wolf whistling for your supper after you play the lucrative The Wolf on Win Street slot game, which will transport you back to a more vibrant, colourful and cash rich destination. In this exciting game you’ll find yourself in the hazy heat of the 1980’s amongst the big bad wolves of the stock market on the legendary Wall Street. You won’t be alone however, you’ll have trusty Wolfie the game’s mascot on your side who will be your loyal companion to help you rack up a fortune. You’ll love this retro, movie inspired slot game and you’ll love the rewards it reaps even more, so sharpen your claws and get in amongst the Wolves and win big. If you like to spin slot games playable online today make a deposit right away! The Wolf of Win Street is a 5 reel slot game played across 20 paylines and has taken inspiration from the Wall Street and their infamous reputation. But don’t fear, as there’s no better wolf to trust with your money than Wolfie who has made himself at home on Win Street with his intimate knowledge of the stock market. 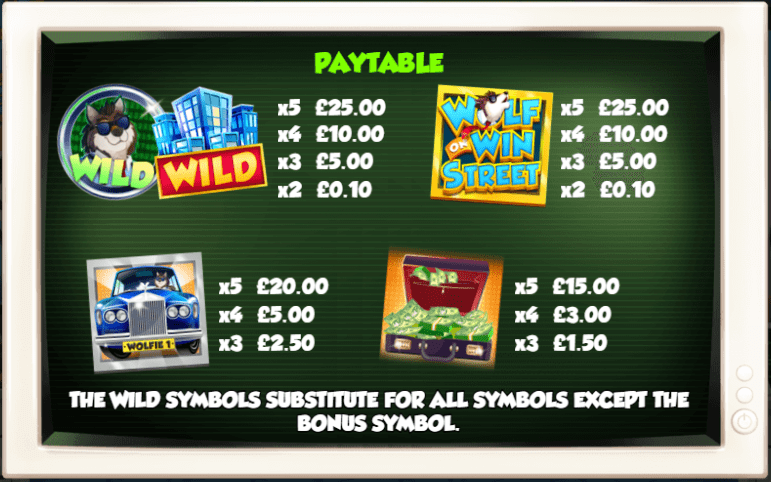 Keep your beady eyes peeled for the features of the game to help you on your path to riches including the Wild Stocks feature which will steadily tick along the top of the reels throughout the game. There are five fantastic base game modifiers to help you hit the top of trusty Wolfie’s Free Spins which will have you howling with delight when you finally reach the top. Visit our guide and see if this game makes it to the list of best online slots you can play. In the game itself, you will see lots of themed, Wall Street-inspired symbols such as a sought after gold Rolex watch, a status symbol that no Wall Street Wolf would be seen without! You’ll also see symbols like the red telephone, a briefcase full to the brim with cash, skyscrapers, a taxi cab as-well-as Wolfie himself. Wolfie and the Sky Scrapers are Wild symbols so watch out for them and the Red Telephone is the scatter symbol, so if you land three of these on the reels free spins will be triggered. If you have a passion for the 80’s and you’re a fan of the film The Wolf of Wall Street and secretly covet Jordan Belfort’s (played by Leonardo DiCaprio) glamorous life style, this is the perfect slot game for you. The retro Wall Street theme is interesting, unique and is bound to serve up plenty of thrills with its ample features and bonuses to be discovered throughout the game. The reels themselves are colourful and vibrant and the graphics are simple but make for enjoyable game play. Enjoying Wolf On Win Street? We'd like to suggest Power Gems!